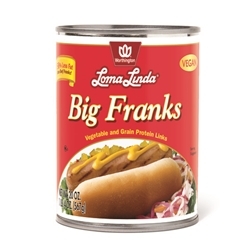 Loma Linda® Big Franks are a meat alternative made with vegetable and grain protein -- canned links that have the taste and texture of hot dogs. Preparation Instructions: Heat and serve in a pan with hot water or in the microwave. Ingredients: textured vegetable protein (wheat gluten, soy protein concentrate, water for hydration), corn oil, water, torula yeast. 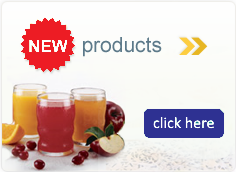 Contains 2% or less of defatted wheat germ, defatted soy flour, dried onion, mono- and diglycerides from soybean oil, salt, hydrolyzed soy protein, garlic powder, autolyzed yeast extract, hydrolyzed corn protein, soy lecithin, caramel color, natural smoke flavor, L-lysine monohydrochloride, spices, concentrated onion juice, natural flavors from non-meat sources, vitamins (niacinamide, calcium pantothenate, Vitamin B1 [thiamin mononitrate], Vitamin B6 [pyridoxine hydrochloride], Vitamin B2 [riboflavin] Vitamin B12 [cyanocobalamin], propylene glycol, soybean oil, red #3 for color. Brine: water, salt.